Well, 2017 has been an incredible year for Nintendo, and in years to come will likely be remembered as a vital comeback for the company. The 3DS kept ticking over, there were a couple of key Mobile releases, but most importantly the Switch arrived and proved to be a success. Demand outstripped supply for much of the year as Nintendo sold as many as they could produce, and it brought the big N right back into the mainstream gaming conversation. It's a system that has appealed to a broad range of gamers in different ways, which bodes well for the company as we move into 2018. As we all know games make or break gaming systems, which is why it's always interesting to see which titles we all enjoyed the most as each year draws to a close. As always we have awards for retail and eShop for both current-gen systems, along with an 'Overall' winner - as per tradition this is also split into Community / Readers' awards and staff votes. Thousands of you took part, so let's start with the community votes - enjoy! 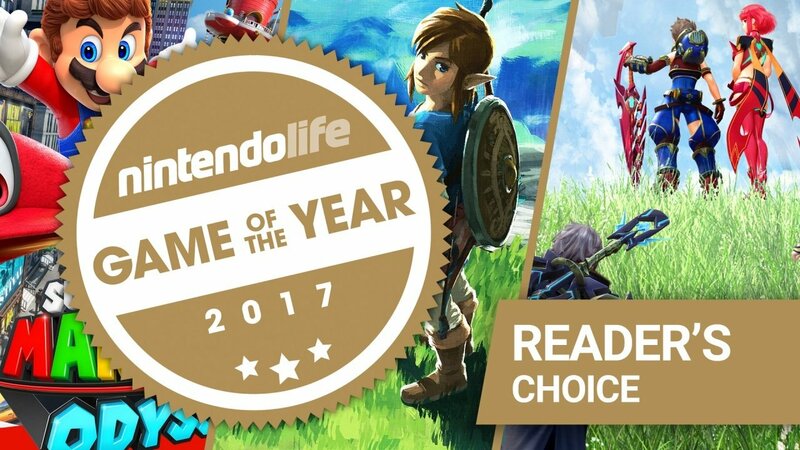 As a fun fact, this is the second year in a row that a Zelda title has won the current-gen 'home console' GoTY from the Nintendo Life community, with The Legend of Zelda: Twilight Princess HD winning the Wii U prize in 2016 (admittedly without a great deal of competition). In this case it was a close battle with the second-placed game, though in the end the revolutionary open-world title (which we should probably also consider as the Wii U game of the year by default) won by a few hundred votes. Sonic made his big comeback in 2017, but it was a talented development team of super fans that delivered the most notable success as opposed to the Sonic Team. A deliberate throwback to the 16-bit glory days (with a healthy dose of Sonic CD, too), this remixes classes stages and also throws in some all new content of its own. With gorgeous pixel art, fantastic music and glorious gameplay, this is the Sonic game we've been waiting for. Only announced during E3, this was a major Autumn / Fall release on the 3DS. Most importantly, it's a fantastic game, providing a modern reimagining of Game Boy title Metroid II: Return of Samus. The link to the original is rather tenuous, as this one has its own ideas and executes them with confidence. Fantastic design along with lovely usage of the stereoscopic 3D effect make this a memorable experience on the portable. We effectively broke our 'no Virtual Console' rule for this one due to it being a relatively quiet year on the 3DS eShop, and the fact that this was the runaway favourite. Nintendo has now released two Game Boy Pokemon generations on the 3DS, each time with plenty of hype and buzz. With the bonuses of wireless trading / battling, Pokemon Bank support and the power of nostalgia, it's easy to see why this was the runaway winner. The voting for this category was rather different, as the community voted for one game out of the top 20 (five from each category). Forcing people to vote for just one game actually enabled Breath of the Wild to secure a dominant win, with 65% of voters deciding it was their top choice. In a quirk of voting patterns this category also saw the order of preferred Switch games move around. Overall, there's little doubt that this was the clear winner in the community of the Game of the Year award. It's already scooped various prestigious awards and lots of praise, and it's a title that gave the Wii U a glorious farewell in addition to serving as the perfect launch release for Nintendo Switch. Turn over to page two for the Staff results. A huge thanks to all of you that voted!